Kennametal, a supplier of tooling and industrial materials, is one of IQ's industry leading clients. From tool holders to edge inserts, IQ has covered a variety of different product renders for a variety of applications. Shown above are IQ's renders for Kennametal's Mill 4-11 and Mill 16 milling components. The Mill 4-11 Series is specially engineered to achieve excellent performance in regards to surface quality as well as higher material removal rates in shoulder milling applications. Its unique design allows the consumer to apply the tool in multiple passes (stepping down) with outstanding results. The new Mill 16 Series is a tailor-made platform for rough milling of components like engine heads and blocks, housings and gear boxes in cast iron materials (CGI, DCI, GCI), and all other cast iron face milling jobs. It's the best-in-class for machining CGI materials. IQ also developed the renderes for Kennametal's various tool holders. Featured on the left is their ___ family of holders for ___. IQ strives to generate content for both print and digital media outlets. It's important to have content easily accessible to our client's consumers. Above are some of the various renders we completed that are on the Kennametal site currently. We assist in the rendering process, as well as the graphic design needed to display the renders in the best way possible. Kennametal offers a complete line of tooling for wheel and axle maintenance in railroad shops. All tools incorporate the latest technology for maximum metal removal and higher productivity. They are proven performers in actual use over extended periods of time, under a wide range of operating conditions. Standard off-the-shelf inserts and fewer pieces of hardware reduce inventory and operating costs. Included in this range are tools for reconditioning mounted wheel sets, wheel boring, wheel truing, axle turning, and journal burnishing. Kennametal Edge Inserts are precise and secure, offering increased rigidity and dimensional accuracy. IQ completed renders for Kennametal's stainless steel and cast iron edge inserts. The smallest details are the most important on parts such as these, and IQ strives to be produce the most realistic renders possible. We make it a big deal when it comes to capturing the smallest details on products like these Cutting Inserrts with numbered faces. There are always ways for IQ to display the product in its perfect orientation. When creating detailed descriptions of parts, we can your needs in creating photo-realistic renders that matches materials and features of the part with ease. Under the Goellner name is AME (Advanced Machining & Engineering) and Hennig. AME is a global manufacturer and distributor of precision machine tool components and metal cutting solutions. 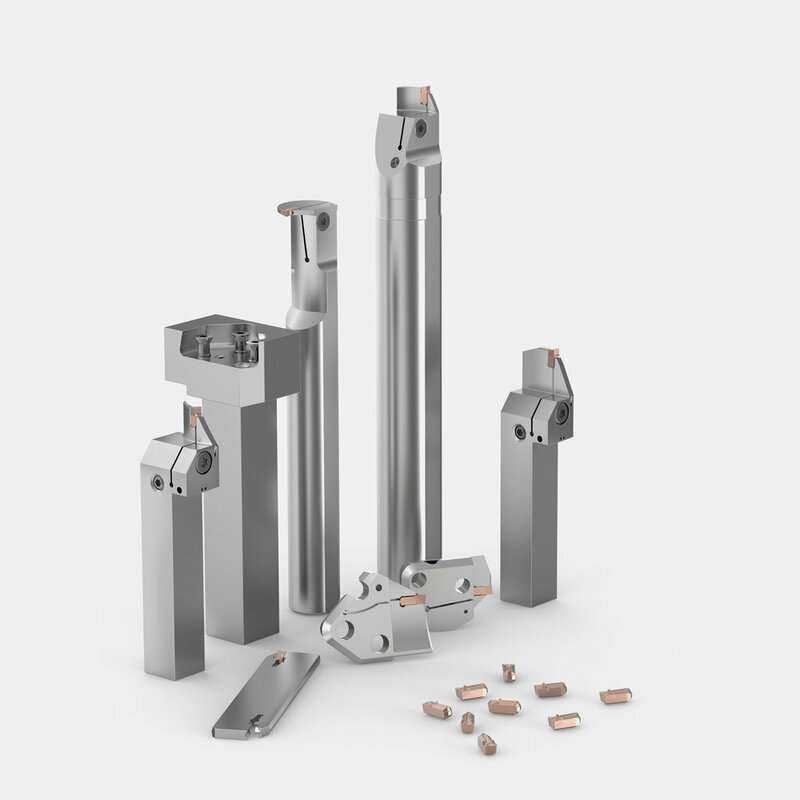 AME's product lines include production carbide saws and blades, tombstones and workholding solutions, power drawbar and spindle components, gravity fall safety and precision holding devices, as well as many other precision machine components. Hennig covers global machine protection, with their products ranging from covers and shield systems, to conveyors and filtration products. Advanced Machine & Engineering and Hennig Inc. had requirements for IQ to render some large tombstones and machinery. IQ was able to deliver multiple projects in a timely manner across a range of needs for website development to advertisements sent to their customers. We found it’s a tough job hire photographers to capture imagery for the products seen in the industry. These tools and machinery sometimes weigh too much to even ship to a location, which then forces the client to setup appointments with photographers to shoot at their own location. Reducing setup time was a goal of IQ and we succeeded by only having our clients deliver digital files that weigh nothing. "We design imagery before the product hits the manufacturing floor." Hennig is a company well know for their pioneering design in the machine protection industry. IQ was able to sucessfully assist Hennig in creating product renders for their feature in the IMTS convention, with this iPad stand. IQ offered Hennig both orthographic views of their stand along with exploded views of the multiple parts. While the orthographic views show multiple angles of a product, the exploded views visualizes the product in a 3D space which allows the user to see all components captured in assembly. 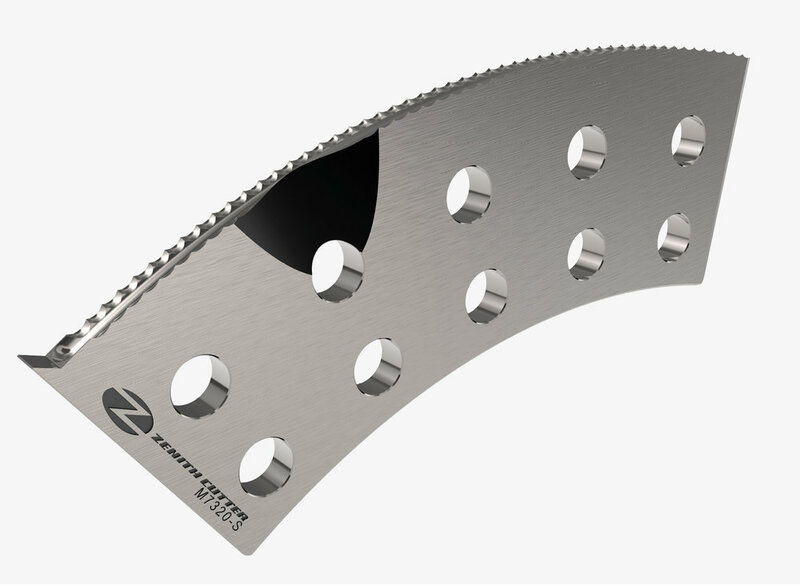 Zenith is a company known to be one of the best industrial knife distribution web-based partner in the world. They offer a wide range of products within this industry that cover a large scale of materials. IQ was hired in order to deliver photo-realistic renders to their web e-commerce platform, Knife-xpress, using unique product rendering views unable to be achieved with photography alone. For Knife-xpress and their sub-brand, Zenith Cutter, IQ was able to deliver imagery for their catalogs that improved their company's marketing efforts. The Zenith Cutter (above) is a knife tool used for cutting cardboard in mass productions of cardboard boxes. The Zenith creaser is also used in the mass production of cardboard boxes, but for the scoring of sides rather than cutting. IQ was able to deliver angled views of each of these Knife-xpress products so that they would be accurately represented and more easily understood. An issue IQ commonly witnesses with our clients is their inability to explain to their audience what each part they’re selling is used for, or what it’s intended application is. IQ solves this issue by offering imagery that supports assemblies and creates detailed ‘ghost views’ that allow the consumer to see each product piece in the assembly. Climate Corporation is a company that aims to build a digitized world where farmers are able to optimize and flawlessly execute their agricultural decisions. The company's proprietary Climate FieldView™ platform combines hyper-local weather monitoring, agronomic modeling, and high-resolution weather simulations to deliver Climate FieldView products, mobile SaaS solutions that help farmers improve profitability by making better informed operating and financing decisions. IQ was hired in the company's initial stages to develop renders for their FieldView Drive product. The FieldView Drive from Climate Corp is a device that automatically captures equipment data by easily connecting to the tractor's CAN Diagnostic port and using Bluetooth to wirelessly map data onto your iPad® and Climate FieldView™ Farmers can also view their data in digital form as you pass through the field. IQ was hired to create photo-realistic renders of the FieldView Drive product in context, and also in an exploded view. The in context renders assist consumers in visualizing the product and how they will use it before purchasing, while the exploded views gave consumers and manufacturers a better look into the components that went into assembly . Working with ISOQUE puts you in good company. Join our list of all happy clients, big and small, by starting a project with us today. We look forward to discussing your needs, and creating amazing work for you.